Brahmakumaris, one of the leading spiritual organisations conducted a three-day National Media Conference 2010 from 17th September 2010 at Mount Abu. Dr Sanddhya (extreme right) interviewing B K Binny (middle). 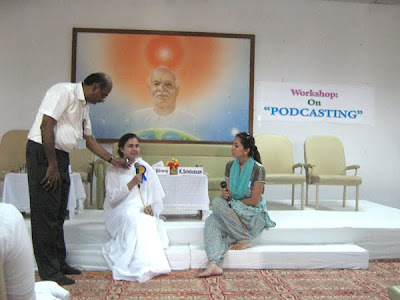 As part of this event, they had requested me to conduct a 'workshop on Podcasting'. During the workshop, to give an hands-on experience to the participants, we asked them to conduct an interview among themselves and to edit the audio live. Accordingly, Dr Sanddhya from Pune, one of the workshop participants, interviewed Sister B K Binny, Public Relations Manager of Global Hospitals, Mount Abu (Rajasthan), who was also a participant. Since B K Binny is already teaching Stress Management through Meditation at various places, the participants in the workshop decided that the topic could be on "Stress Management through Meditation" itself, for the benefit of all. The audio was edited by Kunal C Panchal, another participant from Mumbai. Since the podcast interview was very useful, we decided to share this audio in public for the benefit of all. After the interview, we have also added one minute 'mild music'. The listners may listen to the music and sit in silence with positive thoughts, to enjoy the power of meditation. Please listen to the audio interview by clicking 'play' button (11 minutes). The audio was recorded live during the workshop in the presence of all the participants and edited immediately. The audio streaming will be smooth in broadband connections. If you find any difficulty, you may download the audio in mp3 format, by right clicking this link and save to your desktop. While listening to the interview, please also watch the photographs taken during the workshop. The podcast interview may also be listened from the following link.